"People call me an artist or designer... I call myself a karpintero." Benji Reyes says this as he sits on a rustic bench in his backyard, quietly ruminating over the 20 years he has spent fashioning sculptural creations out of his favorite material, wood. "As a sculptor, ang pinakamahirap na material to work with is wood," he says. "Because once you chip off a part, that's it. Hindi mo na puwedeng ibalik." As the sculptor, designer, and self-professed karpintero pores over his long-lived love affair with wood, it becomes apparent that his passion for the organic material goes far beyond the end product. "The real challenge with wood is that it's a very hard material that you have to make soft, comfortable, and ergonomic," he says, toying with a seed that just happened to flit by from the forested ravine that is his backyard. 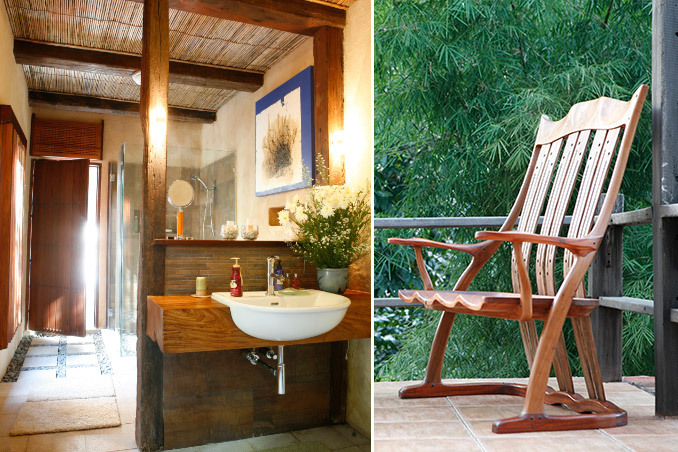 Read the original article ("It Wood Be Nice...") in the January 2009 issue of Real Living Magazine. Download your digital copy of Real Living on the Real Living App now! Log on to summitnewsstand.com.ph/real-living for more details.